The Aspir pump is a sanitary side-channel self-priming pump suitable for use in the food-processing, pharmaceutical and chemical industries. 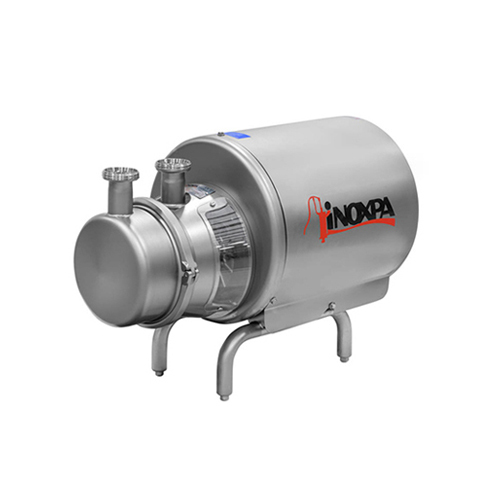 It is specially designed for pumping materials containing air or gas, and it can also be used for negative suction with prior priming as well as with filtration equipment. It can be used with wine, oil, syrups, volatile products such as alcohol, acetone and other solvents, or with products at temperatures close to boiling point. 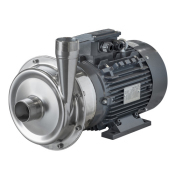 However, the main use of this pump is for CIP return. 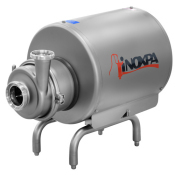 The impeller is housed between the suction casing and the diffuser, it rotates in conjunction with the pump shaft. Due to this arrangement, the rotation of the impeller and the position of the side channel, negative pressure is created inside the suction casing, which generates the suction force of the pump. At the same time, the fluid receives energy in the form of kinetic energy and pressure energy, and this impels it through the discharge casing. 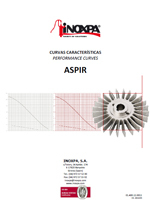 Aspir is a range of centrifugal pumps made of a cold-formed stainless steel discharge casing, cast sainless steel suction casing, diffuser and lantern, star-shaped fixed impeller, and an external mechanical seal that prevents any contact of the spring with the product. The motor complies with the IEC standards, it is protected with a stainless steel shroud made of stainless steel sheet and provided with the height adjustable hygienically designed legs. Pump casing with drain port. Motor with other voltages and frequencies. 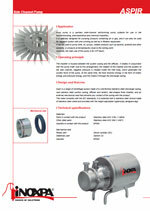 Motor for explosive atmospheres or with enhanced safety level. Summary La bomba Aspir es una bomba autoaspirante de canal lateral que se puede utilizar en la industria alimentaria, farmacéutica y química. 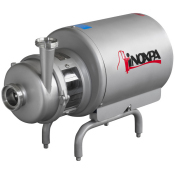 Summary The Aspir pump is a sanitary side-channel self-priming pump suitable for use in the food-processing, pharmaceutical and chemical industries. Summary La pompe Aspir est une pompe auto-aspirante à canal latéral destinée à l'industrie alimentaire, pharmaceutique et chimique. 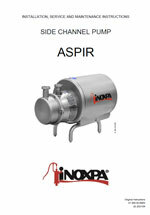 Summary La pompa Aspir è una pompa autoadescante a canale laterale che si può utilizzare nell'industria alimentare, farmaceutica e chimica. Summary Die Aspir Pumpe ist eine selbstansaugende Seitenkanalpumpe, die in der Lebensmittel-, der pharmazeutischen- und chemischen Industrie einsetzbar ist. Summary Модель Aspir представляет собой санитарный вихревой самовсасывающий насос, предназначенный для использования в пищевой, фармацевтической и химической промышленностях. Summary ASPIR is a side-channel and self-priming pump suitable for use in the food-processing, pharmaceutical and chemical industries. Summary Die ASPIR ist eine selbstansaugende Seitenkanalpumpe, die für den Einsatz in der Lebensmittel-, Pharma- und Chemieindustrie bestimmt und ausgelegt ist. Summary Насос ASPIR это самовсасывающий насос с обводным каналом, предназначенный для использования в пищевой, фармацевтической и химической промышленностях.